BRANDON -- Family Promise of Greater Brandon is making good on its promise to provide a path for homeless families to put their lives back together. The church-based shelter program that began in May has had four families "graduate" into affordable housing and new jobs. Largely with volunteers and a coalition of 13 area churches, including seven United Methodist churches, Family Promise is taking a grassroots approach to combat homelessness. The focus is keeping families together in a safe environment while giving them the tools to restart their lives. Though the program is non-sectarian and welcomes everyone, faith and prayer are in abundance as the churches and volunteers, week by week, rotate responsibilities for providing shelter and home-cooked meals. "Who does hospitality better than a church?" asks Deborah Humphrey, president of Family Promise's board of directors and a member of St. Andrew’s UMC, Brandon. "They have members and generally they have space to use. This is what churches do. In the Methodist church, we are taught to serve others." The nonprofit agency is the 10th Florida affiliate of the national Family Promise organization that began in New Jersey about 20 years ago. Affiliates are in more than 180 cities in 41 states and the District of Columbia. Shelter and meals are just the start of what Family Promise offers. At the Family Promise Day Center - a converted single-family house owned by First Presbyterian Church of Brandon - families receive case management services to help in job searches and résumé preparation. The center provides families with a mailing address needed for job applications and other services and transports them in the Family Promise van as needed. Kids and parents enjoy daytime activities at the Family Promise Day Center in Brandon, above, and nighttime shelter in local churches. 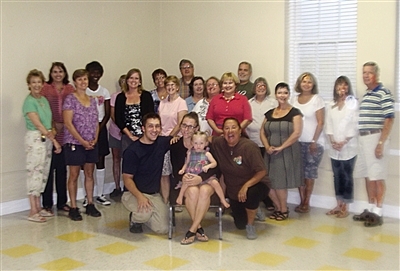 Below, the first "graduating class" of families who found housing and assistance through Family Promise of Greater Brandon, with executive director Kathy Brogli, fourth from right. Photos from Family Promise of Greater Brandon. The average stay for a family in the program is 68 days. Family Promise programs have a record of 75 percent to 80 percent success in helping families become independent again. Case management of families continues for a year after they leave the program. "We're making a difference in the lives of children and their parents," says Kathy Brogli, executive director of Family Promise of Greater Brandon. "I'm really proud of all our families." The reasons for homelessness often are loss of a job or an illness with unexpected medical bills, but Brogli says, "The biggest reason is lack of (affordable) housing." 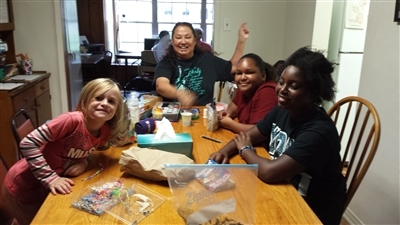 On a recent night, Angela Dionne, head host coordinator for Limona Village Chapel UMC, Brandon, oversaw a dinner prepared and delivered by volunteers. During Limona's rotation duties, Grace Community UMC, Lithia, also helped with meals. A dinner menu might include salad, chicken and rice and sweet potatoes. Everything is planned weekly, "so we don't end up with four nights of pizza," Dionne says. "It's well balanced for families. We want them to be as comfortable as possible." Limona Village converted its fellowship hall into a temporary shelter with cubicles for private sleeping quarters. Two church volunteers spent the night with shelter guests. Children were able to play games and watch television in a lounge area. Tables and chairs created a dining area, and guests had use of a full kitchen. With dinner over, volunteers and guests had time for quiet conversations. A couple of men came in later after getting off work and fixed plates of food. One family was nearing the end of a stay with Family Promise. Robert, 42, had just started a job at Amazon in Ruskin, and in a matter of days planned to move his fiancé and his four children, ages 17, 14, 11 and 7, into an apartment. He brought his family from Indiana and for a while lived with a relative in Pasco County. Even with experience as an electrical engineer, he struggled to find work. For a month, home was his truck. But now Robert says, "I can see the light at the end of the day." When he sees someone on a street corner, asking for help, he says, "I always stop and give them what I've got. You never know what's going to happen day to day." The people on street corners are only part of the story, Humphrey says. "People don't think, 'Oh, he might have a family,' " she says. “You don't know. People who sit next to you on a bus or in an office, they could be homeless." This year, the Point-in-Time homeless count prepared by the U.S. Department of Housing and Urban Development found about 2,250 men, women and children were homeless in Hillsborough County. Families made up about 18 percent. "It can happen to anyone at any time," says 41-year-old Michelle, a mother of two children, ages 14 and 11. "People are one paycheck away from being homeless." Michelle came from Mobile, Ala., to accept a job with a cleaning company. When she arrived, she found there was no job. She and her children stayed with friends for a while and at motels. The lack of a permanent address made it difficult to get her children enrolled in school, but a social worker smoothed out problems and referred Michelle to Family Promise. She is hopeful about finding a job soon, possibly with a janitorial service, and then moving into an apartment. Richard, 43, and his wife, Marta, 35, were jobless and evicted from their home before they came to Family Promise with their children, ages 12 and 9. Richard has found work at Amazon; Marta is working as an intake counselor at a nonprofit agency, Solita's House in Tampa’s Ybor City. "It's been scary," Marta says. "It's been sad. I do have two very good kids. We've always sat down and explained what's going on. No matter what, we won't let anything separate us." The family is struggling to find an apartment the parents can afford. Marta says she worries about getting back into a situation where the family can be evicted. "It's another challenge that we will overcome," Richard says. "I'm just grateful. It's not a fun experience for sure. It's a situation I wouldn't want anybody else to go through. You lose a sense of dignity and pride. There's a lot of emotion that goes with this situation." Family Promise is hosting an indoor putt-putt golf fundraiser dubbed “Tee Off in Tuscany” from 7 to 10 p.m. Thursday, Nov. 6, at The Barn at Winthrop Special Events Hall, 11349 Bloomingdale Ave., Riverview. For information, visit www.familypromiseofgreaterbrandon.org or call Brogli at (813) 681-6170.